SPRING GREEN, WI — Traditional criticism hasn’t been altogether kind to Shakespeare’s early comedy “The Two Gentlemen of Verona,” which is often portrayed as a workshop effort that set the stage for the Bard’s later, more sophisticated riffs on the madness of love. But this summer’s sharply drawn, energetic and sly production at American Players Theatre makes a savvy, satisfying case for a comedy worth catching. 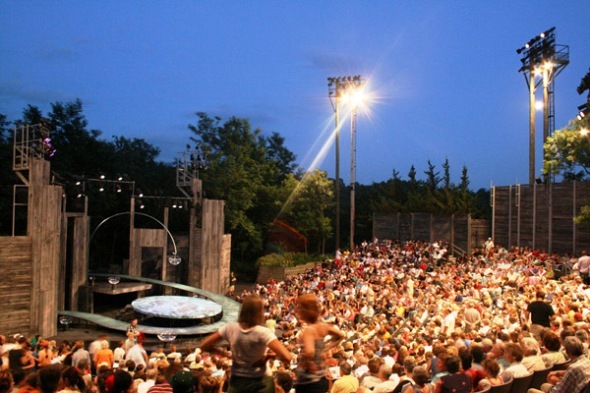 Maybe in part the appeal of APT’s “Two Gentlemen” is simply the infection of a midsummer night in the company’s 1,148-seat open-air performance space, called for good reason the Up the Hill Theatre. The reward of this efficient, comfortable, acoustically focused arena comes at the end of a steep, winding climb – though one can opt to board a shuttle and zip to the top. Yet greater credit is surely due director Tim Ocel and a small ensemble of mostly young actors who have flung themselves into Shakespeare’s tale of love-smitten pals and the stunning betrayal perpetrated by one of them. It’s a funny play, but at its core also deeply serious, a credible coming-of-age story that Ocel and his troupe hone to a touching point. The short of “The Two Gentlemen of Verona” is that young Valentine decides to leave Verona to seek adventure and fortune down the road. 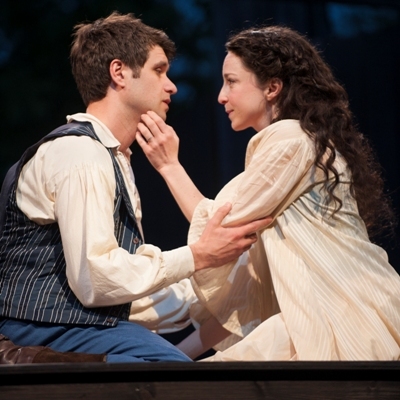 He urges his bosom pal Proteus to join him, but Proteus doesn’t want to leave his sweetheart Julia. Off Valentine goes, and in Milan espies beautiful Silvia. Never mind that she’s betrothed to another guy; Valentine sets his sights on her. Meanwhile, Proteus’ father tells the lad he, too, must widen his horizons and insists that he go abroad, leaving Julia behind with pledges of undying devotion. But no sooner does Proteus catch up with Valentine than he also glimpses Silvia, who happens to be the reigning Duke’s daughter, and sets his cap for her, as well. When Valentine tells Proteus of his plan to elope with Silvia, his good buddy runs straight to the Duke and reveals the scheme – winning the Duke’s praise and an inside track to fair Silvia. But it isn’t going to be that simple. Proteus’ sweetie back home, Julia, resolves to go after her fella and disguises herself as a boy to explore the situation in Milan. The whole business comes to an edgy confrontation in which Valentine displays his maturity, Proteus (perhaps) learns the meaning of true friendship – and true love – and happy matches are made all around. Whether Proteus really has grown through all of this remains open to question. The seeds of later, more nuanced Shakespeare comedies, notably “As You Like It” and “Twelfth Night,” are obvious enough here. But “Two Gentlemen” has its own charm and APT’s production does justice to the show’s several engaging characters. Travis A. Knight is an upstanding Valentine, perhaps too forthright for his own good but in the end the kind of young man every father might wish for. As Proteus, Marcus Truschinski mixes comic impetuosity with a darker impression: that this heedless youth has left his moral compass in his other pants. In rather passive roles that Shakespeare would invest with more initiative in plays to come, the girl-turned-boy Julia (Susan Shunk) and the magnet for all those male hormones Silvia (Abbey Siegworth) are pleasing elements in a play that’s essentially happening around them. James Pickering’s colorful, authoritative performance as the Duke of Milan converts a stock character into a wise man, clever and credible. But the unheralded stars of “The Two Gentlemen of Verona” are, and ever have been, Proteus’ servant Launce – a perceptive fool expounding convoluted wisdom – and his dog Crab. Steve Haggard’s soft-spoken, riotously funny Launce, of reticent bearing and rustic weeds, carries this show from peak to peak. And you can only admire the patience of faithful Crab, portrayed by a stalwart old dog that bears it all for nibbles. American Players Theatre tends to rely more on clear, expressive language than on elaborate sets for its story-telling, and that principle applies here, as well. 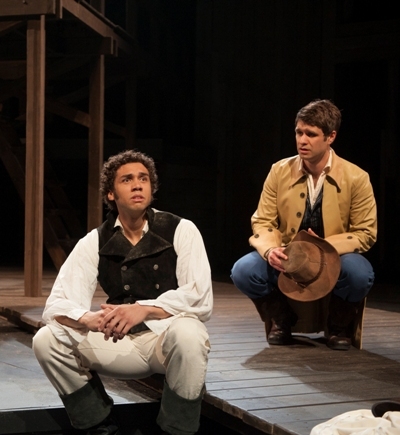 However, while Nathan Stuber’s scenic design is characteristically understated, Devon Painter’s handsome costumes pop. It is, all told, a delightful excursion down one of the Bard’s less-traveled roads. Photo captions and credits: Home page and top: Travis A. Knight, left, as Valentine and Marcus Truschinski as Proteus in “The Two Gentlemen of Verona.” Proteus (Marcus Truschinski) vows love everlasting in his farewell to Julia (Susan Shunk). Valentine (Travis A. Knight, left) is left out as his good pal Proteus (Marcus Truschinski) moves in on Silvia (Abbey Siegworth). The friendship of Valentine (Travis A. Knight, left) and Proteus (Marcus Truschinski) undergoes a perilous test. Steve Haggard plays the wise fool Launce. (Photos by Zane Williams) Below: The Up the Hill Theatre is an intimate outdoor venue at American Players Theatre in Spring Green, WI.